Enjoy - Food & Travel: Enjoy Harvard Square! I recently visited Cambridge, Massachusetts for the first time. I spent an excellent day in the beautiful, historic area around Harvard. Here are some tips if for enjoying food and culture around Harvard Square. If, like me, you travel a lot, you appreciate really good accommodation. 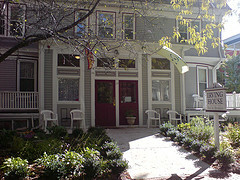 I spent two nights at Irving Guest House, which I can recommend without reservations. Irving House (in the photo) is bed & Breakfast situated in a lovely old house on a quiet street five minute's walk from Harvard Square. The people who work there are all friendly and helpful and the interior is charming. There is a free wireless network throughout the building and a computer available in the lounge by the lobby. The rooms are cozy and very clean. And there are books in all the rooms, which I particularly liked. All of this made me feel right at home and I hope to be back at Irving House soon. My first night in Cambridge, just off the airplane and horribly jet lagged, I went for a stroll and had my evening meal at at Darwin's, 1629 Cambridge Street. Darwin’s bohemian, charming deli and cafe, serving up local gourmet sandwiches, take-out dinners, local bakery breads and goods, and much more. I had a mix of antipasti -- black olives, grilled peppers and zucchinis, and Italian salami. Mmmm! At the Greenhouse coffee shop and restaurant, I had a great big lunch in a charming, busy cafe filled with locals and tourists alike, right on Harvard Square. There is a large menu of all kinds of sandwiches, wraps, soups, burgers... I had a veggie melt which was great and a little Spanish lady sitting at a neighboring table had a burger so large she could only eat half :) The Greenhouse has both a breakfast and a lunch menu and I was very sorry not to have time to try the cakes. I am not an avid shopper, but I love books and I loooove food. So at Harvard Square I spent a lot of time in The Harvard Coop (1400 Mass. Ave.). I have seen a lot of book stores and this is one of the very best. Four floors of books -- all kinds of books. This amazing store was founded in 1882 by a group of students. It was organized as a cooperative and would provide the academic and professional community with a place to buy merchandise at competitive prices and that would also distribute the store-earned profits among its members. To this day, members of the Coop get discounts on all books. Right next to the Coop I found Cardullo's, a family owned food shoppe. It is a tiny store packed with gourmet food from all over the world. I found feta cheese imported from Greece, olive oil from Italy, chocolates from Belgium and Switzerland and even from my home country, Norway. Needless to say, imported specialty foods like these don't come cheap. Still, the selection is amazing and the atmosphere is great. A must! Susanne Koch blogs regularly in the Pandia Search Engine News blog.